I thought for the few of you who followed my RVing adventures last fall, that I would post an update. I believe I have gone out camping now four times since I last posted. I’m losing count, and that’s a good thing. 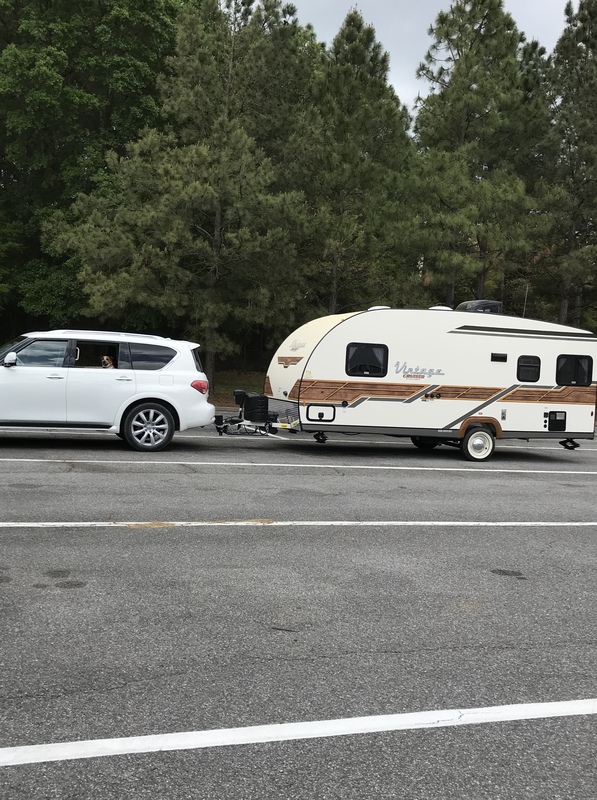 I am happy to report that I have made much progress in learning the skills needed for towing and using the little travel trailer. In fact, last week, when I was hitching up the trailer for Grandson and I to go for a few days at a Florida state park, Grandson said, “You’re gettin’ a lot better at this, Nana.” Since the boy is not given much to praise, I was impressed, and so proud. I have learned what to bring on a camping trip to make me comfortable. I have learned what equipment I like, as opposed to much that is recommended. For instance, I still have not figured out how to work the electronic tire monitoring contraption that many people (men) insist is a requirement. And I like blocks of real wood for supports, not plastic. I have learned that while I like to see the fancy ‘glamping’ other women create–such beautiful and inviting decorating!–I don’t want the work involved. How funny to find I am a minimalist when camping. I want to get where I’m going and get out on a hike. Another thing I’ve learned–I like to hike. Long walks where I figure out problems with the plot of my current WIP (work-in-progress) or simply soak up the quiet and beauty of nature. I’m a lot better at backing up, too! If there is something you want to do, get out and do it. Don’t worry about knowing everything; you will learn along the way. There is light for each step. If you find you don’t like doing whatever it is, you can always stop. But at least you will have found out. Your post brightened up my day with a happy heart. Thanks for sharing my friend. What a smile you give me, Cathy! My impromptu trip back out alone was wonderful time for writing, reading, and getting closer to God. I’m so glad I did it! Thank you for allowing me to camp vicariously! What a wonderful way to unwind and re-group and re-coup! Have a ball! Anne, I had gone out Monday with my grandson, 11 yrs. old. While we did have some good times, and wonderful hiking, things in the kayaking department didn’t go so good, so we came home early. I went back out again for some alone time. LOL! Thanks for sharing this. I love hearing about your travel trailer adventures, Also, i find your adventures to be so inspiring!! I retired a couple years ago, and I know that most of my friends thought that Hubs and I would sit around, playing on computer and reading. But, inspired by people like you, we have gotten out and about, “exploring”, as I like to call it. Thanks again for posting, and yes, I agree this would make a great book!! Stepping out solo has at times seemed to be more than I can manage. I tell myself to stay in the ‘now’, and when needed, assistance has always arrived. You are right–I am learning about myself. Well, even here at home, I’m learning about myself. Widowhood is a whole ‘nother country. The greatest lesson is on trusting God and His Spirit’s voice. So far so good. Love hearing about each of your camping experiences! I applaud you taking this new adventure, envy you! Thanks for the smile. A writer greatly enjoys being read. Life itself is an adventure! Liz, thanks for a title! 🤗 I have wondered if anyone would be interested in a book. I have been thinking of fiction, retro setting of the 50s after the war, when campers really blossomed.